Throughout the Twentieth Century, big business has been a basic institution. Large corporations have provided a fundamental contribution to the wealth of nations and, at the same time, have had a remarkable impact on the political and social systems within which they have operated. It is difficult to understand the development of the most advanced economies if we do not consider the specific evolution of big business in every national case. On the other hand, it is not possible to explain the shape and behavior of big business without considering its development as part of the history of the country in which they operate. The largest US, German, British and French firms were key actors in favoring their nations' development and, even at the end of the Twentieth Century, made a very important contribution to their growth. In many countries, a stable core of large corporations developed only relatively lately, or did not develop at all, and under these circumstances, big business was not able to significantly participate in the economic growth of such countries. Scholars who dealt with the economic history of Italy and Spain are generally unanimous in tagging these nations as industrial late-comers, ineffective in promoting big autochthonous private and State-owned firms, dominated by family companies, and characterized by a strong competitive advantage on the part of small and medium-sized enterprises. 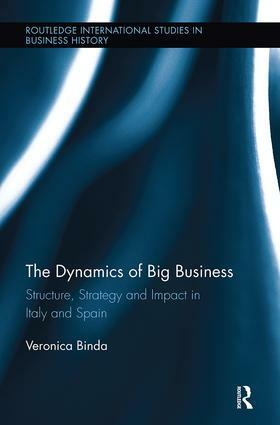 At the same time, Spanish and Italian business and economic historians have tended to say little about the role and features of big business. This book thus fills a significant gap in the work on the development of Southern European capitalism and its large corporations by analyzing the Italian and Spanish cases and comparing them with each other and with what has occurred in the United States and in the largest European nations. Examining both the macro dynamics (national but also supra national) and the micro level, utilizing samples of big corporations and going deeply into some company cases, this volume identifies some important protagonists of the Italian and Spanish economies (such as the State, families and foreign investors) and investigates a wider panorama which includes the political, economic and social relationships of the corporations, providing insights into the form of capitalism that exists in these countries. Italy: Toward a Democratization of Big Business? Changing Fortunes for Spanish Big Business? The Geographic Diversification Strategy: The Rise of Italian and Spanish Multinational Companies? Convergences and Divergences: Does a Southern European Form of Capitalism Exist?